Mokoshan continues to threaten our heroes when he’s suddenly taken aback by Ninjara. The angry werewolf leaps down from his rocky perch and discovers that Ninjara is one of his kindred, and compliments her on her beauty. 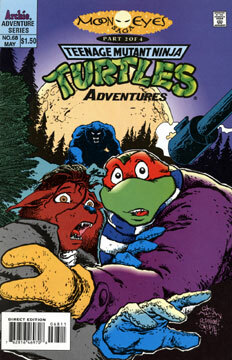 Raph gets angry and tells Mokoshan to head for home to get his clothes out of the dryer. Mokoshan ignores the testy Turtle as wind begins to swirl snow around him – when the air clears, the wolf man is gone, leaving a doe-eyed Ninjara feeling flummoxed. Later that night, Ninjara sits by the campfire while everyone else sleeps – everyone except April, that is. The reporter asks Ninjara if she’s in the mood for some “girl talk” and Ninjara reveals that she’s not in love with Raphael anymore. In the morning the group hits the road. Ninjara and Raph continue to fight. As they drive, Raph spots an “Indian dude” keeping pace with them on foot, but no one else sees the man. The group stops to take a hike and Raph begs Ninjara to talk to him and tells her that he loves her. Ninjara sighs and begins to explain her feelings when the others call them over to view some wolves feeding on a deer carcass. Ninjara spots the old man from the Jeep aiming his rifle at the wolves and screams that they have to stop him. She dives over the precipice that the group is perched upon and lands among the wolves as the hunter fires his gun… hitting Ninjara several times in the shoulder, ribs and thigh! Raphael freaks out and attacks the hunter, ripping the rifle from his hands and threatening him – but the boy appears between the two and beseeches Raph not to hurt his Grampa. Sure enough, that’s exactly what Raphael is doing.